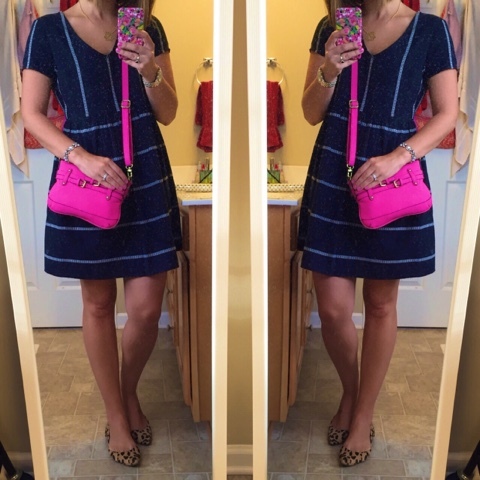 I stalked this dress on clearance at Old Navy until it was a price that I was willing to pay. I scored it for about 10 dollars but after trying it on, I would have paid full price for it. I instantly felt put together when I put this dress on in the dressing room. Julianna was in there with me and she told me how pretty it looked. It fits loosely and comfortably but it's still feminine, which is a must for me. 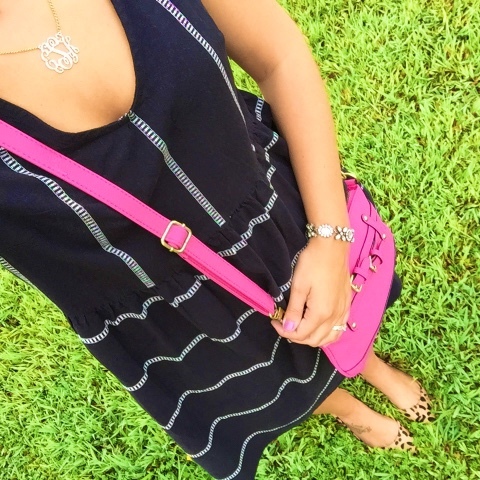 For church, I paired the dress with a pop of pink, my monogram necklace, a bracelet, and leopard flats. Mixing stripes with leopard is a very easy way to pattern mix without looking tacky. The black from the dress and the black in the leopard print compliment each other perfectly. I plan to transition this dress into fall by adding booties, a denim jacket, and a chunky scarf. I love when I fit a piece that fits well, has a good price tag, and will transition perfectly between seasons.